"Cañon" redirects here. For other uses, see Canon (disambiguation). "Gorge" redirects here. For other uses, see Gorge (disambiguation). The word canyon is Spanish in origin (cañón, pronounced [kaˈɲon]), with the same meaning. 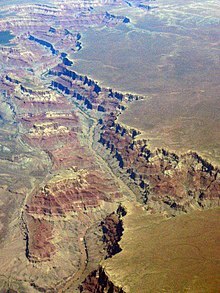 The word canyon is generally used in North America while the words gorge and ravine are used in Europe and Oceania, though gorge and ravine are also used in some parts of North America. In the United States, place names generally use canyon in the southwest and gorge in the northeast, with the rest of the country graduating between these two according to geography. In Canada, a gorge is usually narrow while a ravine is more open and often wooded. The military-derived word defile is occasionally used in the United Kingdom. Canyons are much more common in arid than in wet areas because physical weathering has a more localized effect in arid zones. The wind and water from the river combine to erode and cut away less resistant materials such as shales. The freezing and expansion of water also serves to help form canyons. Water seeps into cracks between the rocks and freezes, pushing the rocks apart and eventually causing large chunks to break off the canyon walls, in a process known as frost wedging. Canyon walls are often formed of resistant sandstones or granite. Sometimes large rivers run through canyons as the result of gradual geological uplift. These are called entrenched rivers, because they are unable to easily alter their course. In the United States, the Colorado River in the Southwest and the Snake River in the Northwest are two examples of tectonic uplift. For the Colorado canyon, see Box Canyon, Colorado. A box canyon is a small canyon that is generally shorter and narrower than a river canyon, with steep walls on three sides, allowing access and egress only through the mouth of the canyon. Box canyons were frequently used in the western United States as convenient corrals, with their entrances fenced. The definition of "largest canyon" is imprecise, because a canyon can be large by its depth, its length, or the total area of the canyon system. Also, the inaccessibility of the major canyons in the Himalaya contributes to their not being regarded as candidates for the biggest canyon. The definition of "deepest canyon" is similarly imprecise, especially if one includes mountain canyons as well as canyons cut through relatively flat plateaus (which have a somewhat well-defined rim elevation). The Yarlung Tsangpo Grand Canyon (or Tsangpo Canyon), along the Yarlung Tsangpo River in Tibet, is regarded by some as the deepest canyon in the world at 5,500 m (18,000 ft). It is slightly longer than the Grand Canyon in the United States. Others consider the Kali Gandaki Gorge in midwest Nepal to be the deepest canyon, with a 6400 m (21,000 ft) difference between the level of the river and the peaks surrounding it. Vying for deepest canyon in the Americas are the Cotahuasi Canyon and Colca Canyon, in southern Peru. Both have been measured at over 3500 m (12,000 ft) deep. In August 2013, the discovery of Greenland's Grand Canyon was reported, based on the analysis of data from Operation IceBridge. It is located under an ice sheet. At 750 kilometres (466 mi) long, it is believed to be the longest canyon in the world. The Capertee Valley in Australia is commonly reported as being the second largest (in terms of width) canyon in the world. Some canyons have notable cultural significance. Evidence of early humanoids has been discovered in Africa's Olduvai Gorge. In the southwestern United States, canyons are important archeologically because of the many cliff-dwellings built in such areas, largely by the ancient Pueblo people who were their first inhabitants. The following list contains only the most notable canyons of the world, arranged by continent and then country. For a more complete list, see List of canyons. Valley – Low area between hills, often with a river running through it. ^ Society, National Geographic (20 May 2011). "canyon". National Geographic Society. ^ Ward Cameron. "Understanding Canyon Formation". Chisholm, Hugh, ed. (1911). "Canyon" . Encyclopædia Britannica (11th ed.). Cambridge University Press. ^ "The Geology of the Grand Canyon". Retrieved 2015-10-01. ^ "box canyon". Encarta World English Dictionary. 2009. Archived from the original on 2009-10-31. Retrieved 2009-08-04. ^ "China Virtual Museums: Canyon". Kepu.net. ^ "Park Statistics". National Park Service. USA. ^ Truong, Alice (1 July 2011). "Everything About the Grand Canyon". Discovery Communications. Retrieved 5 February 2012. ^ Cohen, Callan; Spottiswoode, Claire & Rossouw, Jonathan (2006). Southern African Birdfinder. p. 210. ISBN 978-1-86872-725-4. ^ "Grand Canyon of Greenland Discovered under Ice". news.discovery.com. 2017-05-10. ^ Fitzsimons, David (14 December 2015). "Capertee Valley: Australia's own Grand Canyon". Daily Telegraph. Retrieved March 28, 2016. ^ Kruszelnicki, Dr. Karl S. (22 May 2012). "Grand Canyon is not so grand › Dr Karl's Great Moments In Science". ABC Science. Retrieved March 28, 2016. Look up canyon in Wiktionary, the free dictionary.